When I start talking about home decor with friends or in general, the one thing that I always seem to bring up is my need for a home library. I usually get an odd stare, like there is something more important I should be doing with my square footage. But I don't explain or apologize, I love books and that's really what it's all about for me. that is something i want so badly in our home...it makes TOTAL sense to me! i go back and forth with how to arrange the books. For a good two years I had them arranged by subject...then another two years, they were arranged by color (which made sense to me, but probably nobody else). Sometimes I wonder if I should re-cover them all...but then I think it would make it more confusing? If I had the room for this I would love to re-create the Apartment Therapy photo..beautiful! 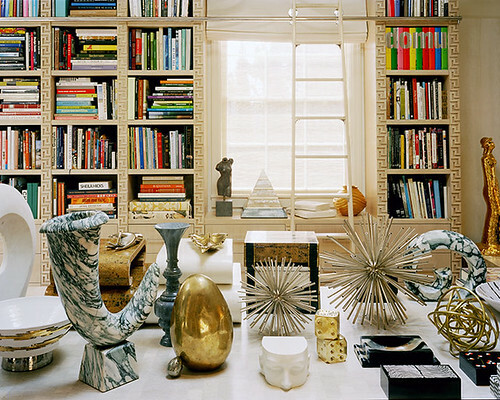 @Tracy - That is one of my favorites, I actually saw those bookshelves (or similar) in Ikea. It's on my must have list! I love all of these! 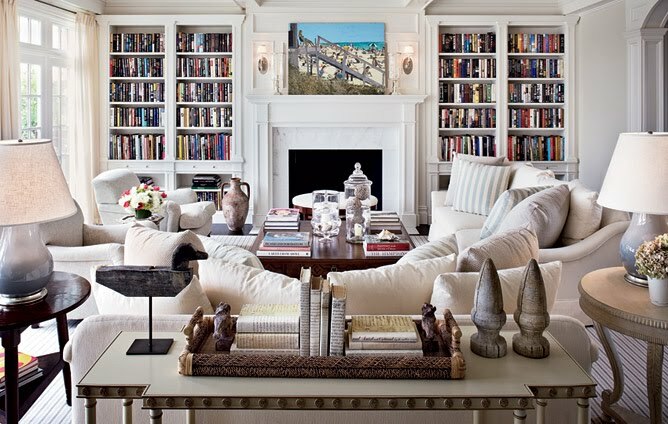 Book shelves are one of my favorite things about a room. And I love the different patters on the pillows in Rachel Roy's room!